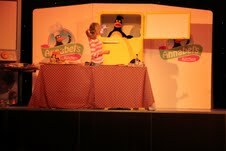 The culinary duo took theÂ show to several Haven Holiday parks up and down the country for fun, games and cookery. TheÂ script was written by Brian and the set was built by the Little Shop of Hires Company. Brian would like to thank all the members of th Haven Funstar teams who helped make the shows so much fun.